I love pizza! Such a convenient (and affordable!) way to enjoy some tasty pizza, easily customized to everyone's taste preferences. Red onions and bell peppers are my favorite pizza toppings, my husband loves pepperoni. Thank you for the great recipe! Yum! I make a variation of this all the time! Great way to make a little personal sized pizza that's no fuss and no muss. Thanks for sharing! Margherita pizza is my favorite version - great history! My brother loves these. I wish I had a real pizza oven in my house. Always a pleasure to stop by your blog. Great food and I always learn something I did not know. This was my favorite afternoon snack when I was a kid! I love any pizza and yours are so tempting! There's one time I even make spaghetti bread pizza. haha.... Hope you're a great weekend, Christine. enjoy. how can you go wrong with any type of pizza! it looks delicious! Hi Kim Bee, a pizza oven in the home would be great. Anncoo, this bread pizza would be good for breakfast, lunch and dinner. The children would love this for after school snack. So simple and creative! Yum! I do love pizza, but I never thought to use just a standard slice of bread to whip it together. Great idea. I used to buy Stouffer's French bread pizza, but discovered that buying my own French bread and make my own pizza topping is so much better. Great snack! Yes, any time is a good time for pizza, especially when it is this easy! Great pics. I used to make these as a kid. Simple but delicious. We just started following you , I saw you on Emily's blog!! 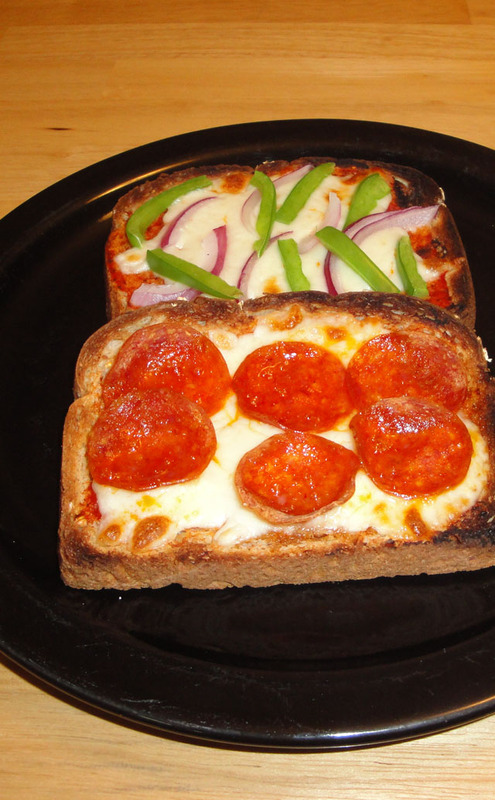 Your bread pizza is such a great idea, I don't know why I haven't tried making this at home. Maybe because the kids have all grown up, but hey, next time I'm making these for myself! Hi Foodiva, you deserve to make bread pizza for yourself. What a easy and yummy looking pizza. My daughter loves to make this. I do make from time to time this for my kids..such a great idea, and fast..You did fantastic job!! Looks good! My grown kids will love this! Thanks.